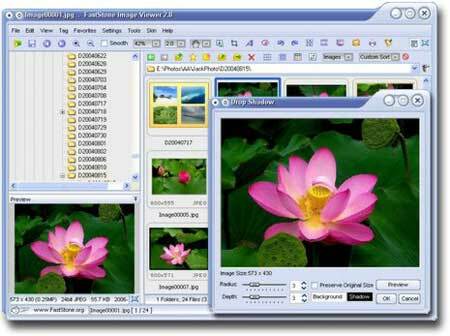 FastStone Portable Image Viewer is a Free, fast and user friendly image browser, converter and editor. It houses many cool features such as image viewing, management, comparison, red eye removal, emailing, resizing, cropping, color adjustments, and even musical slideshow creation with transitional effects. FastStone Image Viewer supports BMP, JPEG, JPEG 2000, animated GIF, PNG, PCX, TIFF, WMF, ICO and TGA and popular digital camera CRW, CR2, NEF, PEF, RAF, MRW, ORF, SRF and DNG Raw formats.